Kalmunai Zonal Education Director M.S. Abdul Jaleel presents a certificate to a participant. Picture by I.L.M. Rizan, Addalaichenai Central Corr. 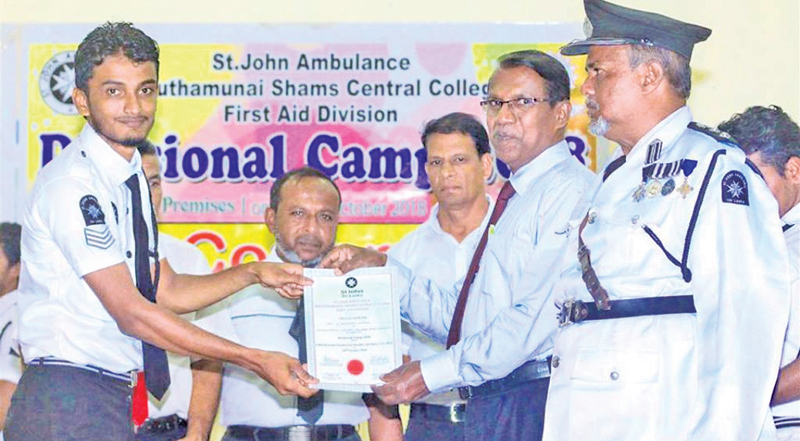 The Maruthamunai Shams Central College's St. John Ambulance First Aid Division held a one-day workshop on first-aid, recently. It was held under the patronage of College Principal A.L. Shakab. Kalmunai Zonal Education Director M.S. Abdul Jaleel was the chief guest, while St. John Ambulance First Aid Division District Commissioner M.H.M. Mansoor, Deputy Shams Central College Principal M.M.M. Muzarraf, Al-Hikma Junior School Principal M.L.M. Mahroof, and Assistant District Commissioner Lieutenant M.S.M. Mifraskhan were the special guests at the event. Kalmunai Zonal Education Director M.S.Abdul Jaleel said that it was the duty of teachers and principals to guide future generations on the right path. Students should be moulded so that they would be able to face any and all challenges ahead, he said, adding that only an educated society could show progress.